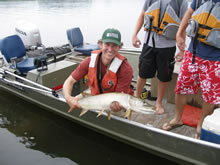 Water quality in the Upper Mississippi River System is important in determining habitat quality and ecosystem function. Standardized monitoring is done with two different designs. A Stratified Random Sampling (SRS) design is used to estimate parameters within six selected study reaches. A Fixed Site Sampling (FSS) design is used to collect data from selected tributaries and selected sites in, or near, the study reaches. The objective is to track status and trends in the selected parameters. Some parameters are measured in situ using automated field data collection software. Water samples are retained for laboratory analysis of such parameters as nutrients. Focused research is used to answer specific management questions that often cover multicomponent topics at varied spatial scales. The studies may utilize the standard monitoring data or other existing data, or require separate field data collection efforts.